Okay, Confirmed, Evander Kane Is A "Playoff Player"
In his ninth season, in his fourth city, Evander Kane had played 574 games without ever making the playoffs. (That was just five games shy of Carolina’s Jeff Skinner, who now has no real challengers.) So when Kane earlier this week called himself a “playoff player,” he was talking style, not experience. Kane is still just 26, though it feels like he’s been around forever, and his move from Buffalo to San Jose was the biggest splash of a pretty mild trade deadline. 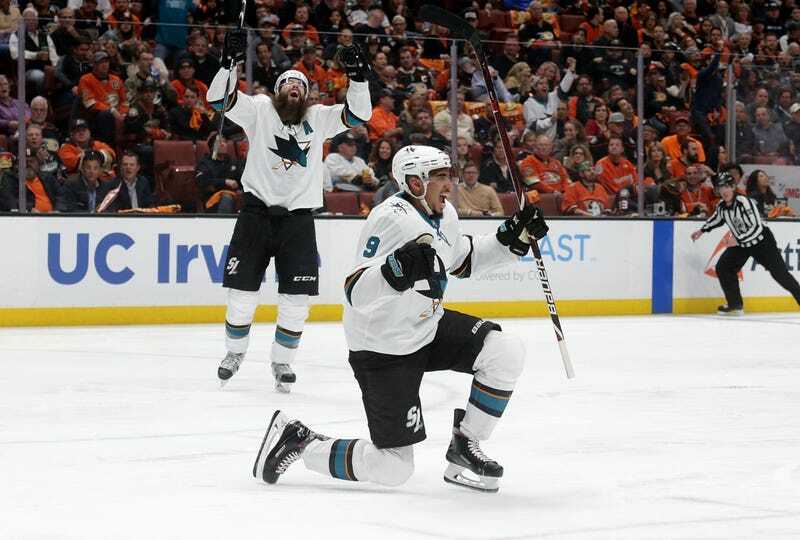 And Kane’s been excellent, scoring nine goals and five assists in 17 games with the Sharks and pacing San Jose’s late surge to yet another remarkably quiet 100-point season. Kane and Pavelski doubled the lead just six minutes and change later, turning a turnover into a 2-on-1 and pretty much sealing things up theree, because Martin Jones looked excellent in net. Kane can do, well, a little bit of everything. He’s big, he’s fast, he’s tough, and he can score—“sives us an extra layer of everything,” center Chris Tierney said of Kane—and he thinks that roundedness will serve him well in the postseason, when everything tightens up. “I’ve said it in the past. I think I’m a playoff player,” Kane said on Monday. “I’ve watched the playoffs and when I look at the style of play and it’s something I was jealous because I wasn’t involved in it. Now I get that opportunity and I have to back those words up. Sharks coach Pete DeBoer has been using him everywhere, because there’s nowhere he’s not useful. He’s on the top power play unit, he’s played on the penalty kill, and he’s worked himself up to the top line alongside Pavelski and Joonas Donskoi. I think his speed and his explosiveness fit in especially well in San Jose, whose game relies so heavily on the forecheck. This is a long way from Buffalo, that’s for sure. As a team, these Sharks are ... well, they’re not special. (Not that Anaheim is either, mind you. Frankly I’m a little annoyed that I will have to care about one of these teams for more than one round.) It feels like more of the same as in recent years, a good regular-season team that ultimately exists to be postseason cannon fodder. The ceiling is not high. But for the first time in a while, there’s what feels like a meaningful personnel change. Patrick Marleau is out, Evander Kane is in, and if Kane is excited about this, maybe I can try to be too.